PLEASE CAREFULLY READ OUR SPECIALS, OFFERS AND BOOKING CONDITIONS BELOW BEFORE MAKING YOUR ENQUIRY OR BOOKING REQUEST. 4 bedrooms / 2 bathrooms. Sleeps 10; max. adults 8. Kristie's on Fraser is one of Happy Valley's most popular holiday homes, and is perfectly positioned for any of your chosen holiday activities- fishing, swimming in crystal clear lakes, fresh-water flowing creeks, champagne rock pools, walk in lush rainforests, bushwalking, miles of beaches and sand tracks to drive on, sand blows, shipwrecks, turtles, dingos, abundant birdlife and much more. Saturday nights are not available unless in a 2-week or combination booking. 1 week = 6 nights, Sunday to Saturday. If you’d like even more information before booking, we are happy to help. 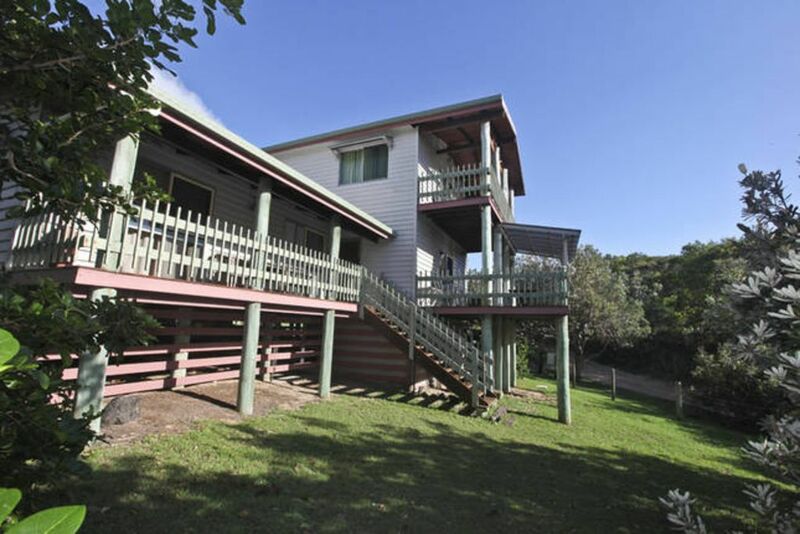 Kristies on Fraser - your home away from home on Fraser Island. Immediate deposit of half of the total rental payable is required to secure a booking. Balance of holiday is due 4 weeks prior to start of holiday. Payment of the rental deposit constitutes the client's acceptance of this property's Terms and Conditions, available on request. Fully equipped kitchen, BBQ on the deck. Large family 2-door fridge/freezer, and chest freezer. Open plan dining / living. Phone for local, incoming and emergency calls. Master Suite upstairs- Queen bed, walk-in robe, ensuite, sliding door to private deck. Bedroom 2- Queen bed, built-in robe, wall fan, sliding door to verandah. Bedroom 3- Queen bed, built-in robe, wall fan, sliding door to verandah. BunkRoom- 4 singles, bunk-style, wall fan. Pillows and Blankets are provided, all beds have pillow & mattress covers. BYO- ALL sheets, pillowcases, towels, teatowels, etc. 24hr power is provided by our own Solar Installation. Use of plug-in appliances other than those provided is NOT ALLOWED. is strictly 4wd territory. You can BYO [permit required from NPWS] or hire from Hervey Bay or Rainbow Beach. is a National Park and your domestic pets are not permitted on the island. is a remote destination, and ready access to medical assistance is difficult. Access to other services such as mechanical, electrical, plumbing, etc. is also very limited. The resort at Happy Valley has a shop/convenience store which has a limited range of fresh and frozen food and groceries. Your holiday home within World Heritage-listed Great Sandy National Park. Go fishing, go 4wheel driving, go swimming, go sightseeing, go canoeing, go birdwatching, go rockpooling, go spotlighting, go paddleboarding, go play beach cricket, footy or volleyball, go stargazing, or go take a hike! Cool off in a lake, or Eli Creek, or Champagne Pools.